On a call a few weeks ago, someone asked me what are the top things I’ve learned from my experience helping artists? I realized I didn’t have a pat answer. How do I distill down the last 9 years of teaching classes to more than 5,000 artists? In no particular order, here are my thoughts on the subject. Not all of these apply to every artist, but most of them apply to most emerging artists. Good art does not sell itself. Except for when it does. Either way, you can’t depend on luck to make a living. You need to go create more opportunities for yourself. Women have it harder. Of the 100 best-selling living artists in the world in 2017, there were no women. Some galleries don’t work with women. Women are socialized to not ask for sales, or not to take up space in conversations. This hurts their careers. That said, it’s getting better and you can’t let this dictate your actions. The biggest obstacles artists face. Knowledge on how to sell and the belief that it can be done are usually the two biggest things emerging artists lack. The first one is easy to solve. The second one is much more difficult. You can’t buy belief. A distant third is the ability to build a habit of working on a schedule and repeating successful actions. Learn to let go. Stop attaching your self worth to your art career. You’ll have more success and be happier if you do. Learn how to tell a good story. Everyone thinks Jackson Pollack’s work could be done by their kid until they learn how, and why, he did it. Successful artists don’t depend on inspiration. They work regular hours, whether that means making new art or doing the promotional work they need to do to sell it, and they accept that its all part of the experience of being an artist. Seeing artists succeed is probably one of the most exciting things that I do. Earlier this year, an artist emailed me to tell me that she took a class two years ago, and now she was absolutely killing it with new sales. She had been absolutely quiet during class, and I don’t think we ever had any kind of extensive conversation. I probably cried for 5 minutes after reading her email. To be able to have that kind of impact is humbling and amazing. I’m really lucky to do what I do. The most common thing artists avoid doing. Artists have a tendency to avoid marketing or anything that isn’t making art. Literally, if you’re not spending 50% of your art-business time working on selling, you’re not spending enough time on marketing. Information is worthless if you don’t use it. Too many artists spin their wheels taking marketing classes and never doing the work. If I catch artists doing this I forbid them from taking our classes or coaching with me. I’ve probably turned down a dozen high-end coaching clients for this. Last night I told 150 people on a webinar this, right after I offered them a class. The Internet and technology can be a crutch and a distraction. The majority of art is still sold offline, in galleries and art shows and open studio events. Social media and the web should be focused on getting people to see your art in person. Spending 6 months getting your website ready is a means of procrastination usually born out of fear. Instagram will ruin your life if you depend on it long term. Relationships are the most important thing in business. I can’t tell you how many artists I know who could never get a showing in a gallery are wildly successful because they focus on their relationships with their collectors. This doesn’t just mean people with a million social media followers. It can also be a relatively unknown artist with just 100 true fans who buy everything they make. Too many artists fail to meet the basics of professional conduct. Communicate in a timely fashion. Write coherent sentences. Show up and deliver work on time. Be kind. If you can do those things, you’ll be better than 80% of your fellow artists. We will give you the knowledge, and surround you with people who will support you and cheer you on. The rest is up to you. 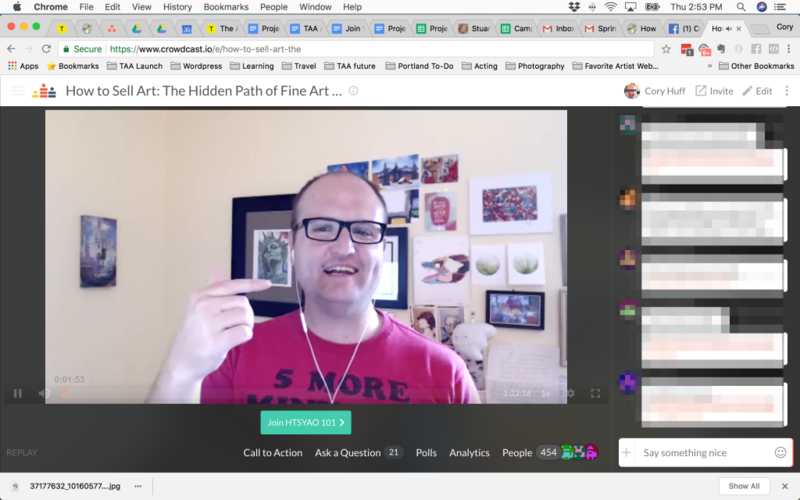 Want to join us for How to Sell Your Art Online 101? Enrollment is open now.